Want to escape to a snowy location? No idea how to dress your kids so they don’t whine about being cold? We lived in Germany for a few years, my son attended a waldkindi (forest preschool) where they spent the entire winter outside every day for 3-4 hours. 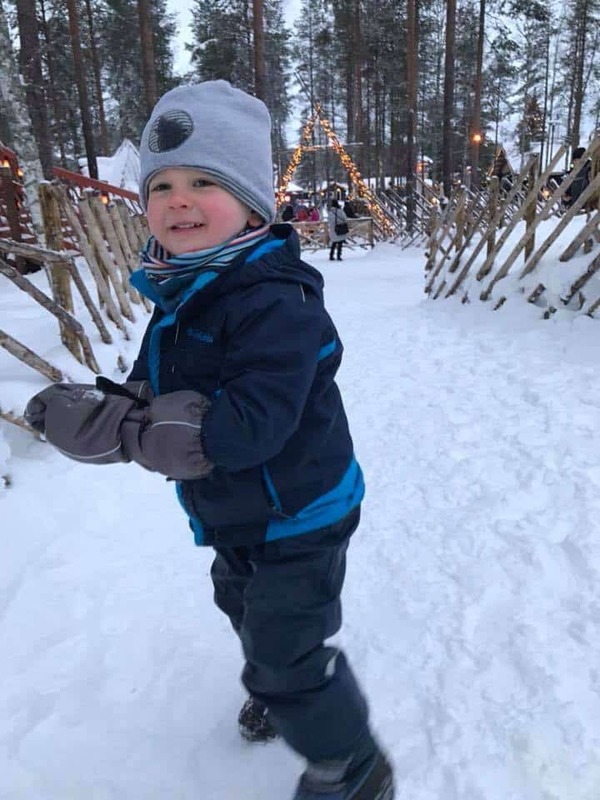 We have also visited Alaska and Finland in the dead of winter so I’ve got a few tips to keep those little ones bundled, warm and having a blast in the wintery cold. Check out our guide to dressing kids for winter weather! I’ve included some brands that worked for us, but that’s just a starting point. It isn’t an endorsement for any particular brand. But buying cheap isn’t always the answer with winter gear. Make sure it will hold up during a snowball fight or a quick sled ride. Layers… It’s all about the layers. 1. Base Layer: Start with an underlayer (after the undergarments of course). This should be polyester. Think long johns. We use various brands (cuddleduds and fruit of the loom). Just needs to be tight fitting (snug, not constricting). 2. Cotton Layers: Next, add a long sleeve cotton shirt and long pants. We used cotton leggings and plain cotton shirts from H&M. We find that pants, especially jeans are too much fabric once we add additional layers. We like the freedom of movement of the leggings and they are easy to get up and down for bathroom breaks. 3. Outer Layers: Time for the fleece layers. We like 3-in-1 coats and snow pants with bibs (an extra layer under the fleece coat). You can also pair a fleece jacket with a snow jacket that isn’t lined. Same concept. If it is really cold, below zero or you will be outside for an extended time without moving, add a layer of fleece pants. 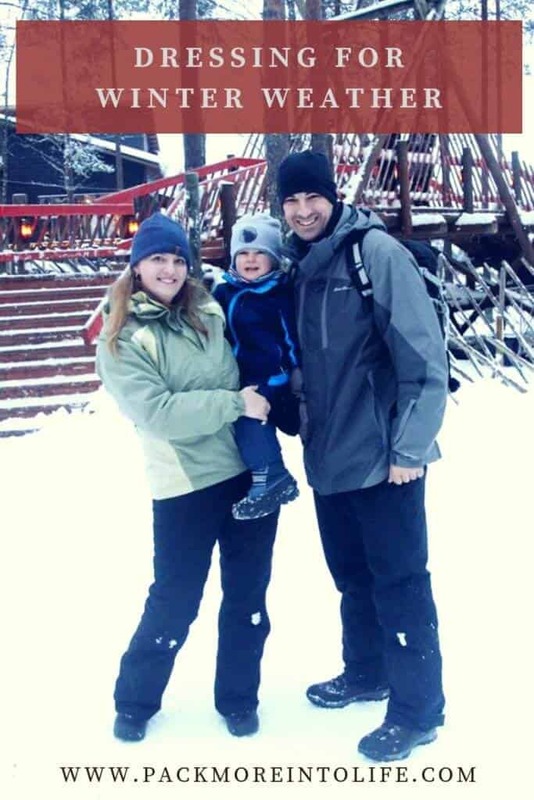 If your child will be active and not outside for a prolonged period of time, you can skip the fleece pants (also true with fleece lined snow pants). 4. Waterproofing: Add the waterproof outer layers. Snow pants and snow jacket. Make sure they are waterproof. You can always refresh an older jacket in the wash with a waterproofing solution. You just toss it into the washing machine and follow the product directions. For jackets and snow pants, we like Columbia, North Face and LL Bean. You want waterproof zippers and seams. If you find more plastic fabric style snow pants, they double really well as slippery sled pants. My son spent many days just sliding down the hills on his plastic pants! 5. Feet: We use wool socks and then winter boots with liners. We like boots that you can remove the liner inside and dry it between uses. We’ve discovered Stonz winter boots and love them. Easy to get on because they open wide at the side, they have a removable liner and they are SO lightweight! Kamik boots are another favorite. Just look for that liner, it makes all the difference. We also prefer lighter weight boots. It’s hard enough to walk in the snow. 6. Accessories: Mittens, scarf, and hat. For mittens, look for ones that are long! Mittens are much better than gloves. You want all the fingers together to retain warmth. Buy ones that you can zip up or Velcro almost to your child’s elbow. Trust me, they won’t fall off and your child’s hands will remain nice and toasty! We prefer mittens that are waterproof and lined. Since we lived in Germany, we liked the brands Jako-o and vaude. But our favorite snow boot company just came out with some great mittens, check them out here: Stonz Mittens. Instead of a scarf, we used neck gators. We preferred ones that had both cotton and fleece. Make sure you get child-sized since they will fit snug and leave fewer gaps for air. We put the fleece base near the neck and then scrunched the cotton on top. It could be quickly pulled up over the nose and mouth if needed. It is much easier to breathe through a cotton layer when the frosty winds start to bite. Hat: I know everyone likes to buy fleece, but cotton is so much better. The head can breathe, especially for active children. Your child is less likely to feel as if they are “too warm” and yet they will retain enough heat to keep them from getting cold. A fleece or wool hat will work if your child will be not as active. Now your child will be ready to tackle the cold winter weather! Make sure to add in breaks for some hot chocolate and hydration breaks. Disclaimer: Pack More Into Life is a participant in the Amazon Services LLC Associates Program, an affiliate advertising program designed to provide a means for sites to earn advertising fees by advertising and linking to amazon.com and its partners. Amazon and the Amazon logo are trademarks of Amazon.com, Inc. or its affiliates. Thank you for supporting my site and helping me make it the best family travel resource on the internet!